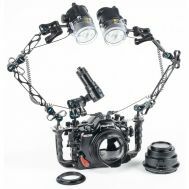 These Ultimate DSLR system packages are fully configured! 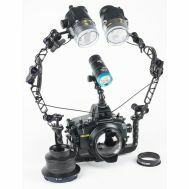 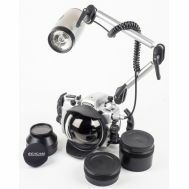 Developed by the experienced team at Optical Ocean sales, these systems have rugged housings, ports, lens gears, a focus/video light, strobe with sync cord, arms, and any necessary arms and mounts. 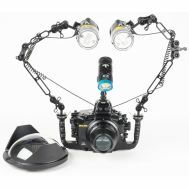 These are the ultimate, over-the-top dive packages for the DSLR cameras and are professional and versatile - you can shoot excellent macro, moderate and wide angle photos and video - but still be fairly compact and portable. 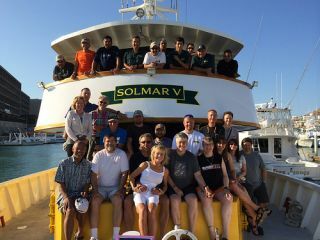 Twenty-one underwater photographers boarded the Solmar V dive boat in Cabo San Lucas, Mexico, on June 23rd expecting to steam the next 25 hours to the Revigadagos Islands, aka "The Socorros", 250 miles offshore. 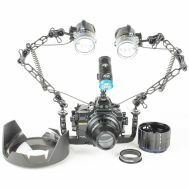 Alas, "Amanda" had other ideas. 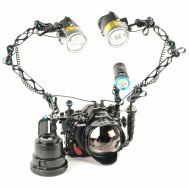 Having built up to a Category 4 Hurricane, Amanda was an early violent storm a few hundred miles south of Socorro Island and heading straight for the area we were to dive. 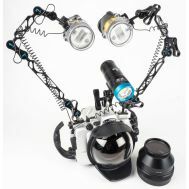 Needless to say, the Captain told me that we had to make a big change and head north into the Sea of Cortez.